ashishradhika – Page 2 – Sussegad…. Doesn’t the mention of your brother or sister bring all of this to mind & more? My brother & I have a special thing. I mean, wouldn’t you, if you had walked him, when he was but a lil baby & would grab your finger with complete trust ? Or the way he would follow you like a shadow wherever you went & not allow you a single moment alone with your friends? Remember the time during a Raksha Bandhan long ago when he gave you 1 Re as a gift , that too borrowed from dad? Or that time when you & he travelled all by yourselves on the train? When you recorded songs together & couldn’t stop laughing ? When you could bully him into submission when he was little? And then you couldn’t really risk it anymore once he grew up to be bigger than you ? What about the time you broke the news of your intention to marry a non Tam Brahm, the first in the family to know? The times you shared your excitement about a new book or a movie? When you made up nonsensical stories together? When you simply talked nonsense which only the both of you could understand? But then it does have its advantages too …as you gradually grow into a relationship based on more than just silly arguments…where you can be friends more than siblings, and where he suddenly overwhelms you with his grown up ness . I remember we had a pact in childhood – that no matter what happens or how much time passes or however far away we might be – we will never let anything come between us….I hope! I really must thank my parents for having the courage to have a second child even after having me 🙂 Otherwise, I never would have known & shared all the quirky & wonderful memories I share with him. Siblings are the best, aren’t they? Baba Ramdev ya Gabbar Singh? Baba Ramdev is holding the country to ransom. And our weak government , already scarred by the furious popularity enjoyed by the Anna Hazare fasting campaign across the country, sends top ministers to go haggle with him and to appease his ,well, hunger…? Sort of like the tales of our mythology where the Gods sent the heavenly apsaras to distract the penance of the Maharishis … Though by no twist of imagination can Pranab Mukherjee be seen as Urvashi ..! But seriously, we are a democracy after all .Democracy is …. a Rule of the people? So a Baba Ramdev can threaten a fast & bring the government to its knees. Anna Hazare can fast & arm twist the government to agree to pass something as dubious as the Lokpal Bill. MNS activists can cause riots against non Marathis & cause damage to life and property , & pass unscathed. A Shiv Sena student can allege that a certain book contains opinions which are broadly insulting of Bal Thackeray & The Sena, & an institution as old & reputed as Mumbai University promptly bans the book without stopping to see if the claims are verified. Yes, we are a democracy. True , it is incorrect to club in the same camp the hooligans in the Sena (both of them) with people like Anna Hazare & Baba Ramdev – but aren’t they essentially doing the same thing? While one is using its political clout & sheer hooliganism to get away with anything, the other uses the emotional clout it enjoys amongst the vast majority to get the government to agree to its demands. Who is to decide what is good & what not? Or which method is more acceptable? We are debating the appropriateness of bringing the PMO’s Office & The Judiciary under the Lokpal, but what of these elements who hold the entire system to ransom with abandon? What of these blackmailers? So yes, we are a democracy. But do we deserve to be one? I believe there is a basic unsaid premise of a democracy, which is a government of (mature) people, by (mature) people, for (mature) people. You can’t expect the freedom & therefore the responsibility that comes with it, to be appreciated & upheld by people who are, basically, immature. Therefore we have people like our politicians who can’t see an inch beyond their own immediate power & monetary gain, a media which can’t seem to go beyond increasing their TRPs & their circulation figures by simply pandering to whichever news is more juice worthy… and we, the public at large , who just can’t seem to cast away our apathy, mired as we are in our own selfish little worries –rise in prices, kid’s education, new job, child’s wedding et cetera et cetera. Baba Ramdev & Anna Hazare are loved & respected by millions of Indians and have the enviable position of being close to ordinary citizens while being in a position of influence. They would do well to engage with the government & the people in a mature manner to bring about sweeping change. About a year ago, I wrote a post on this blog announcing my intent to catalog recipes that have existed in my family for generations… and like most hopeful outbursts of good intent… I never really did much about it. Yes I did end up noting down a recipe for Vanilla cake… a post that still draws a surprising number of google hits… but that was pretty much it. However, like good karma… a recipe for Biryani as fabulous as the one I recently managed to lay my hands on is of no value unless it is shared with the world. And share she did…. Thank You So Much Sona Didi ! So here it is… A Mutton Mughlai Dum Biryani made in our traditional north Indian kayastha way…The recipe that follows has been written by Sona Didi ! This biryani is influenced by the two cities our family is deeply connected with.. Lucknow and Allahabad. 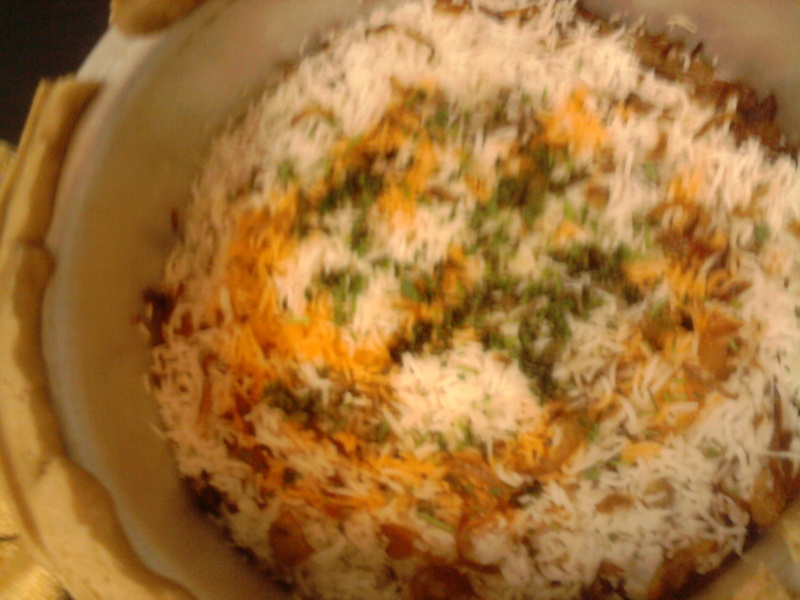 This biryani is prepared by cooking rice and meat separately till they are nearly done and then finally assembling them in layers before being put on ‘Dum’. And here is what they look like together… nice ! 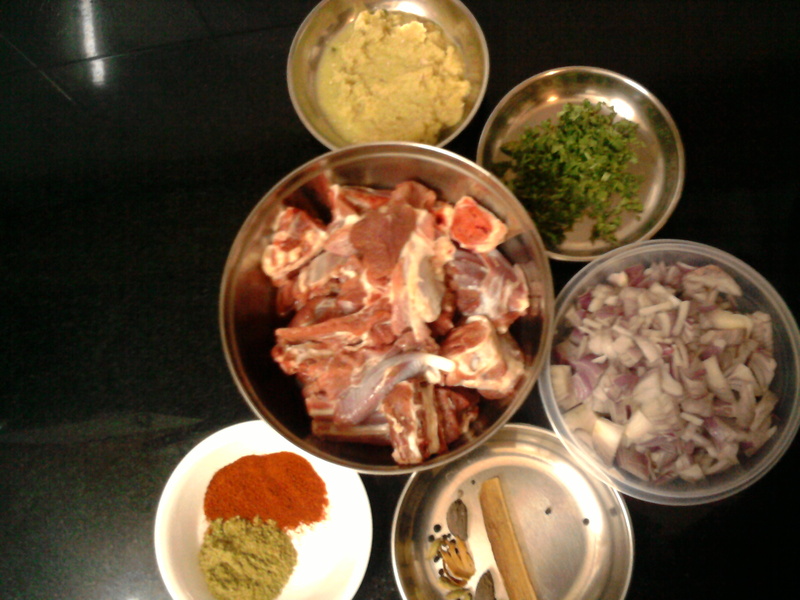 Now add all the other ingredients , except garam masala powder, along with the meat. 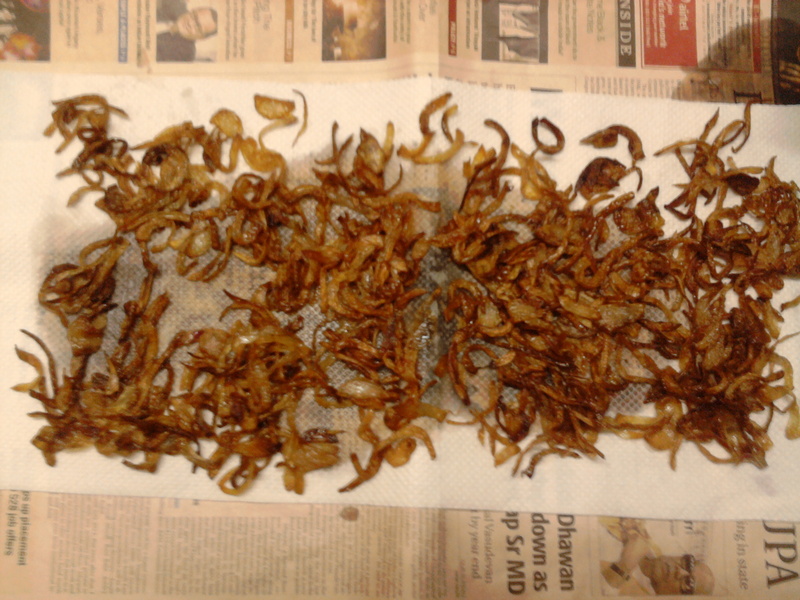 Fry thinly sliced onions till they are brown and crispy. 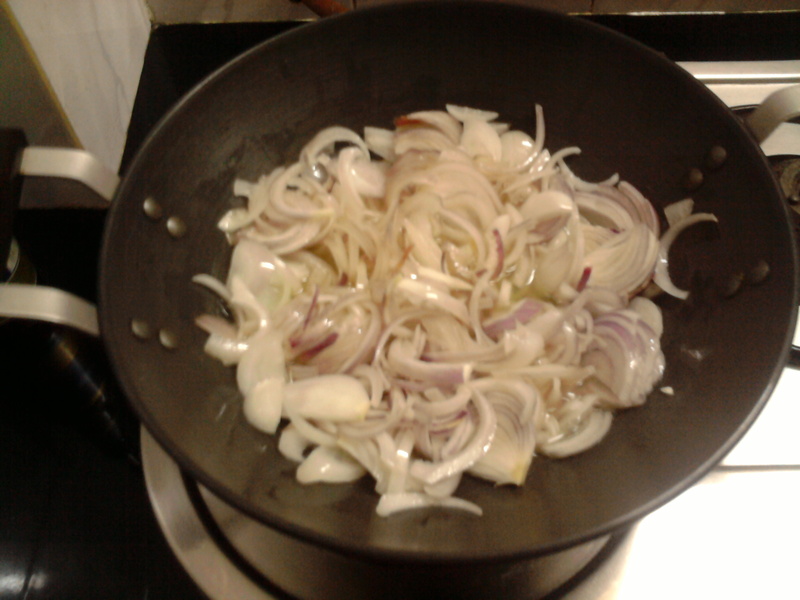 Take time while doing so… cooking the onions on low heat makes them very crispy. 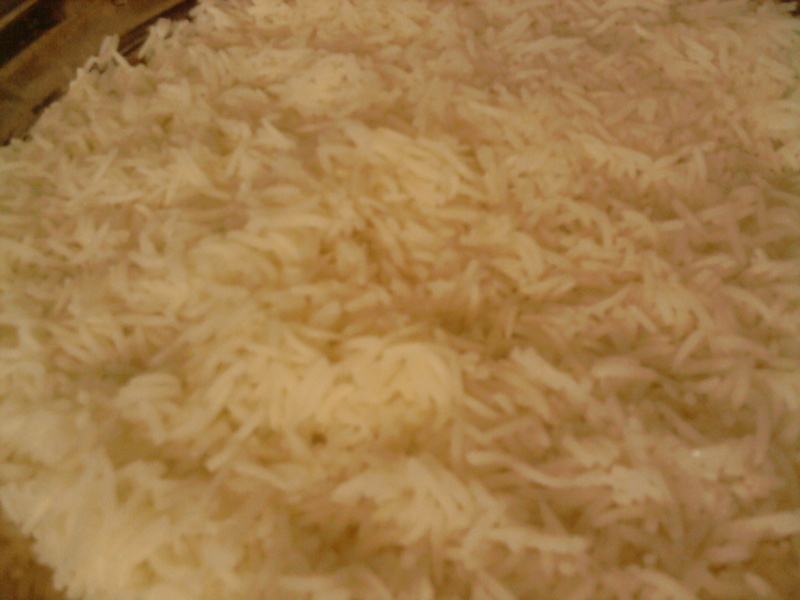 Soak rice for at least ½ an hour (take good quality long grain basmati rice). 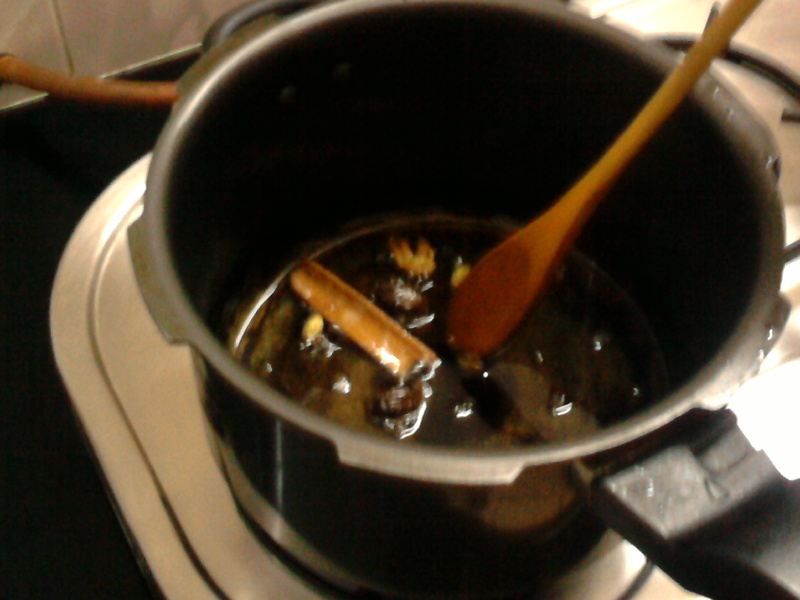 In a large container boil 2½ ltrs of water with two heaped tsp of salt, few peppercorns, staranise, clove & green cardamom. Add a tablespoon of oil to prevent rice from sticking. 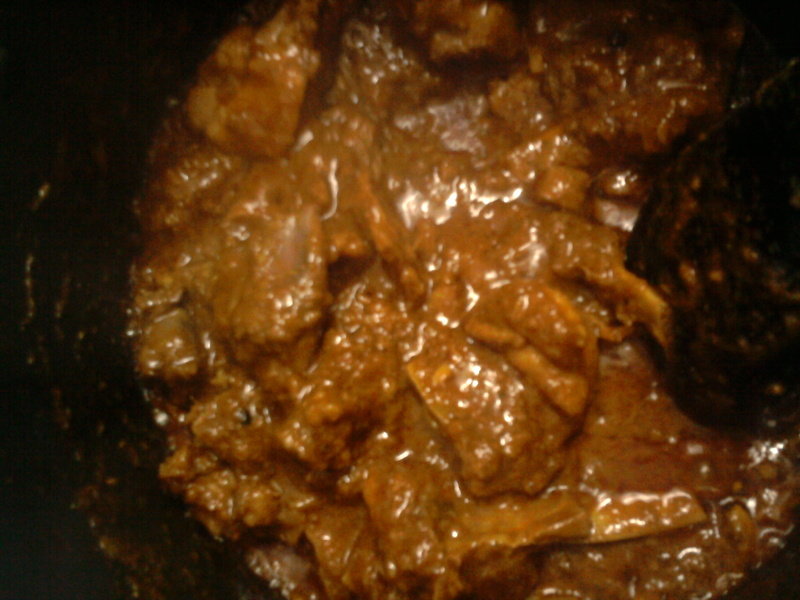 When water starts boiling add soaked rice & let it cook till the rice is ¾ th cooked. Strain the rice in a strainer and immediately put cold water over it to stop cooking. 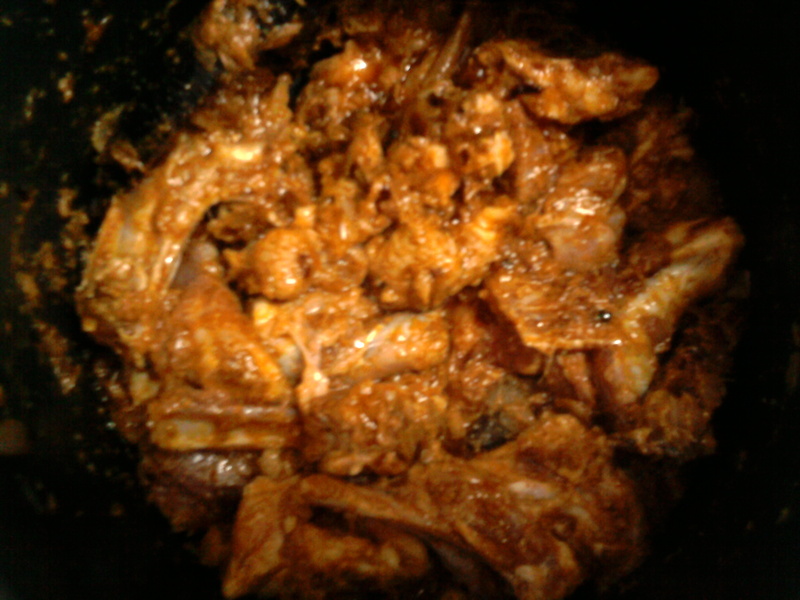 Take a thick bottomed pan smear some ghee, now spread a layer of rice, on top of it put 1/3 part of cooked meat, some fried onions, few drops of soaked saffron with some kewra essence or orange food color diluted with some water and kewra essence, one tbsp of ghee, repeat this process two times. To seal the container you can use atta dough or you can also use aluminum foil. 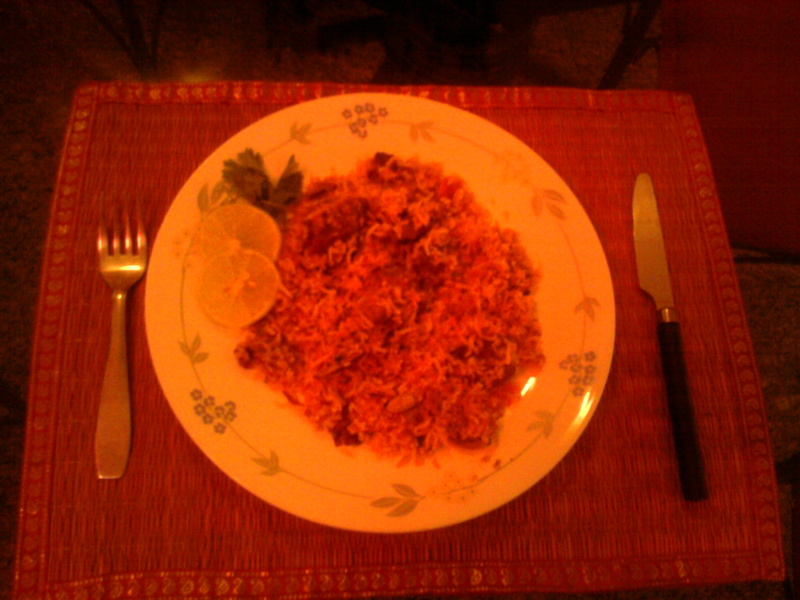 Put the biryani on very low heat and cook it for at least ½ an hour. 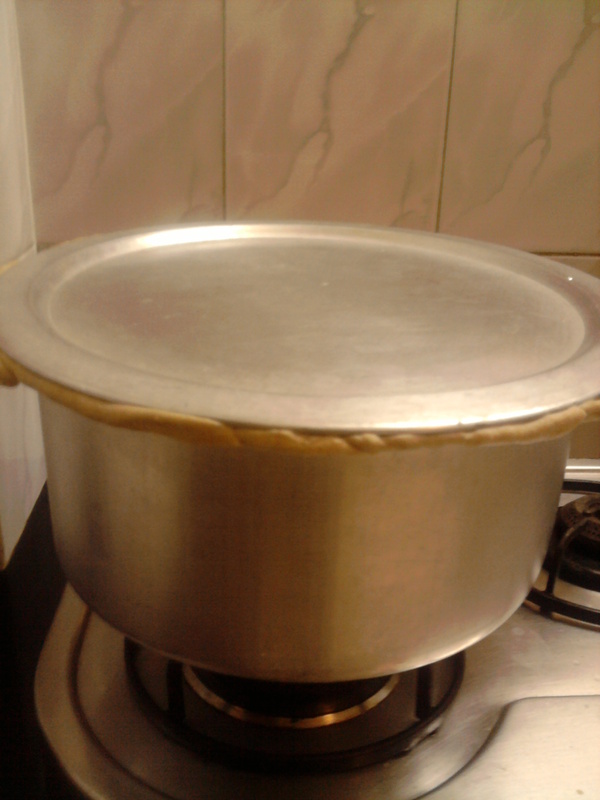 Once the biryani has been cooked, open the pot and give it a good stir. 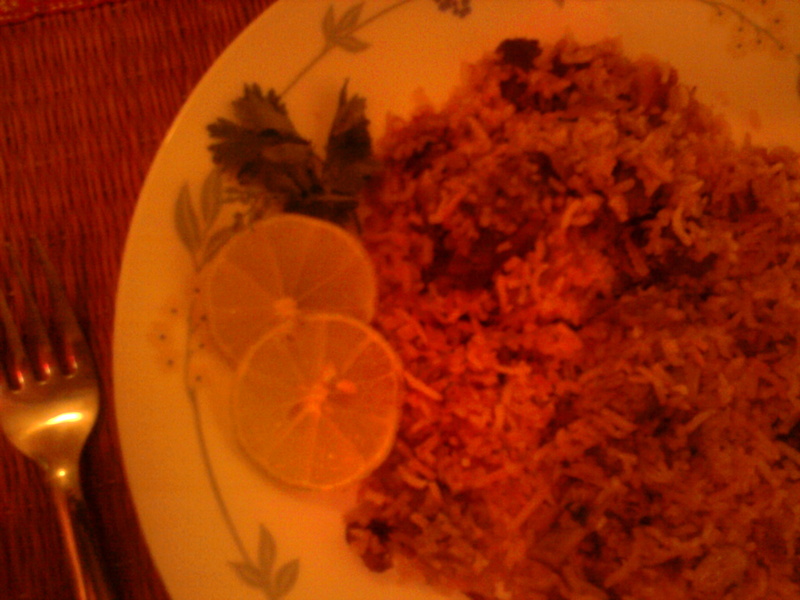 Your Biryani is ready ! So wordpress summarizes the performance of each blog at the end of the year… this is how ashishandradhika.com did this year ! 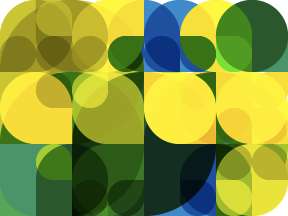 In 2010, there were 14 new posts, growing the total archive of this blog to 98 posts. There were 11 pictures uploaded, taking up a total of 358kb. That’s about a picture per month. The busiest day of the year was September 16th with 115 views. The most popular post that day was A few dusty books…. (a story). The top referring sites in 2010 were facebook.com, samvedg.blogspot.com, orkut.co.in, orkut.com, and myprivategarden-sapling.blogspot.com. Some visitors came searching, mostly for ashishandradhika, sussegad, candle, ashishradhika.com, and diwali candle. I found my way to the verandah and sat on the footsteps leading into the house. The sun was bright and sunny, the warmth of the sunshine embraced me as I emerged from the shady interiors of our house. Three bedrooms, one kitchen, one hall and a verandah…all wrapped together by a piece of land we called our garden … vegetables planted in the back and flowers grown out front. I had to call my uncle to get the sordid details… an internal infection, a high fever, a sudden failure of the body organs, and suddenly, my home seemed so far away from Mumbai…. How many times have you said goodbye to your mother? I missed my family terribly for the first few months at college, writing long winding letters and making anxious call home each weekend… I cannot really pin-point when was it that I moved on from being home sick to falling in love with my college life. “Can’t you get a job in Delhi, its closer to Kanpur? Why Mumbai?” She had asked, just once. I was too filled with pride at my newly acquired job to notice the hint of sadness in her question. I packed away my stuff making sure that I carried some of my favorite books along. She helped me clear up my book cases, absent mindedly flipping the pages of some books that she had bought with me together over the years. They waved as I entered the airport… standing next to our old family car… and I waved goodbye never to look back. We sat by her side through the night… the medical equipment blinked and beeped and her breath rattled in her chest as it strained its way through her tired body. The needles and tubes running in her body, her matted hair against the pillow, and eyes slightly clenched as she slept. In the morning, after a spell of disturbed breathing, she passed away. The next few days were a blur of ceremonies and rituals… all I remember are snatches of conversations, grieving faces, all of us pouring a blend of ingredients into a holy fire. Amongst all of this, I found myself tearing up each time I saw her picture laden with garlands. I lit up a cigarette and breathed in the smoke, and smiled wryly as I remembered how much she hated my smoking. Well, some things are hard to let go of I guess. I walked all the way round to the back of the house… our vegetable garden needed to be weeded. I could almost see her bent over the rows of plants, using tools improvised with kitchen utensils to hoe the soil, uproot the weeds and trim the dry branches…making space for the fruits to grow… making sure that the fallen leaves, did not hold back the young saplings. I treaded carefully amongst the rows of plants, trying not to get too much mud on my leather loafers… and then I saw it, nestled amongst the sprigs of coriander, a tiny sunflower seedling. “It will flower if you water them”, I smiled as I stubbed my cigarette..
Papa asked in his somewhat annoyingly pompous way, his eyebrows arched as he peered at me over the rim of his glasses. “Oh come on Dad what do you mean?” I snapped.. It had been one of those beastly Mondays at work… the early morning conference call turned out to be useless since most of the key people invited decided not to join in. The mid-day review meeting was a disaster with each of the project parameters being in the red, and the end of the day was capped with an excruciatingly drawn out 2 hour long commute to cover a distance less than 15 kms. And on top of that, she has not been taking my calls since our argument on Sunday night. I mean I know I was the one who missed out on our date, but what do you do when your boss tells you to deliver something like, Now? But yeah, she does not want to understand. She is hurt, she says, and well, I am not going to call again. So I come back to my apartment and joined my father for a drink… hoping for a much needed respite from my day. And he asks me with a drink in hand, if I knew what he did for a living ! I remained quiet… not really sure what my father was driving at. “I am selling my spirit for money you say !” Exclaimed my father raising his glass. “Work?” He asked me, with that famous arching of the eyebrows again. He shook his head and got out of the car. He stood there looking at the vast expanse of the dusty Sahayadris. The hills seemed barren, devoid of life, vestiges of vegetation burnt by an unforgiving summer sun. He got back into the car and revved the ignition as he stared straight down the road. Dive Agar was still a good 2 hours drive away. He still could not believe that he had agreed to this trip. It was insane. She had been unusually silent for the last few days. She did not say much anymore anyways. They were both well into their thirties and the marriage had lasted a decade… A house and two kids, great careers… they were living the Indian middle class dream…. “Ok, if that’s what you want.” He shrugged as he went back to watching the news. “How did we come to this?” She thought to herself. She remembered her wedding, in all of its excruciating detail. Her trousseau, all red and gold and silks… the lavish wedding feasts, his crinkly silk kurta and the moment her hands were placed into his, covered with betel leaves and showered with grains of rice. She hardly knew him then… even though they had been brought up in pretty much the same neighborhood all their lives. Their fathers had been friends, and decided that marrying off their offspring was the logical thing to do. They did get a chance to meet before the wedding was finalized. He had arrived at her home with a troop of relatives, who had then left the two of them alone in a room to talk. Her father had seemed immensely satisfied when his family called up in the evening to confirm the match. Her mother congratulated her, beaming with pride at the fate that awaited her daughter. She had gone back to her room trying to understand what she had committed herself to. A fifteen minute chat with a stranger had lead to a commitment for life. Her mother usually spent more time browsing through saris before deciding not to buy any. Was marriage so easy, so inconsequential, so trivial? And then, my father decided that my mother needed a daughter-in-law. I tried to reason, but my father went into one of his interminable silences… till the time I agreed to get married. And before I knew it, I was set to be married to a girl from my town, a girl I barely knew. I hated it all. The ostentatious wedding, the unnecessary relatives, the relay race of photographs at the wedding reception. After a whirlwind of a week, I found myself headed to Prasad Lodge at Dive Agar dreading the thought of spending 10 days with a person I barely knew. 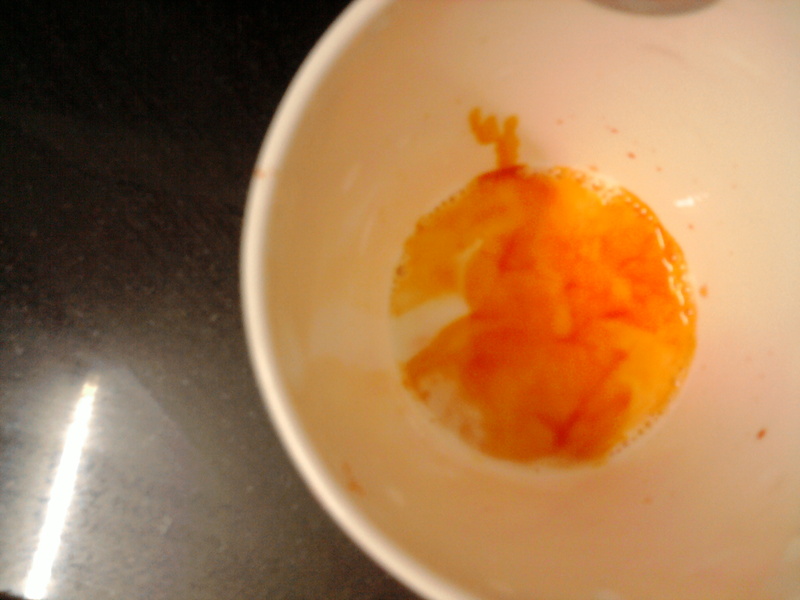 It had been a long dusty journey to Dive Agar. His father had loaned us his green Ambassador for the journey. He drove so well. I kept sneaking peeks at him sitting next to him. It took us four hours before the Prasad Lodge came into site. It was a single floored wooden structure. Green coconut palms and betel nut trees huddled around the house in an intimate embrace whispering secrets to the gentle breeze. The wind carried a promise of rains and the evening was punctuated by the low roar of the waves on the nearby seashore. Prasad Anna, the proprietor showed us to our room. A large airy room with a teak wood bed and a sprawling desk facing a window. The window opened into the orchard outside. “There is not much to do at Dive Agar”, said Prasad Anna, clearly amused that someone should have chosen to spend their honey moon at his lodge. I started to unpack our luggage while he lay back on the bed exhausted. Before I knew it, he was fast asleep. It was barely lunch time, and I could see the play of lights among the leaves from the window. The orchard looked cool and inviting. I stepped out for a look. It was so quiet. The birds seemed to be subdued by the afternoon heat and warbled quietly in the shade. The sound of a slumbering sea was ever present. The grass was cool under my bare feet, a warm fragrance of ripe jackfruit wafted in the air. She walked all around the old building… examining the low verandah that surrounded it. She sat on the steps to the verandah and savored her first true moments alone since the madness of the wedding carried her away. I walked over to the small door where a wooden plaque stated ‘Library’ rather grandly. The door was open and I stepped inside. The room was strewn with books. Some on the ground, some on the wooden ledge running along the wall, a few on the chairs and then some piled on to the shelves. The corners of the library were fighting a losing battle with cobwebs and a patina of dust overlay everything. In the center of the room, Prasad Anna sat engrossed in a book, immersed in a languid pool of yellow light underneath a green lamp shade hanging from the ceiling. She bent down and picked up a book lying next to the doorstep… “Pride and Prejudice”… its cover torn and dusty, the pages falling apart. “Jane Austen”, Prasad Anna exclaimed as if the two words were answer enough for any questions she might have asked. “ I have all her books, I am just not sure where they are”. “Are all these books yours?” She asked, somehow a treasure trove of English classic literature seemed incongruous inside a rural Konkan cottage. “Wait, I will get the brooms” he said as he scampered away. For the next 2 hours she swept and cleaned the small room. Gathered the books in piles and placed them in the center of the room. She made a list of supplies… brown paper, glue, labels, needles and twine and sent Prasad Anna to the small market to fetch them before the shops closed at sundown. He woke up to the sounds of flocks of birds returning to their nests…hundreds of them, chirping noisily as they raced each other back. He walked across the orchard to the main house… it was a structure made of brick and wood. “Not a bad place to retire at… away from the teeming masses of Bombay, just like Prasad Anna”. He knew Prasad Anna had sold off a family business in Bombay before settling down here. He walked purposefully to the library he knew so well. Having spent hours there during his earlier visits. The door was ajar and the room inside was dimly lit. “You are reading Pride and Prejudice !” He exclaimed, surprised to find her reading Jane Austen. “Yes” She said, delighted that he could recognize her favorite book. “Look like the innocent flower, But be the serpent under it..” She said with a with a wicked smile. Prasad Anna walked back to the cottage with bags in hand. He stopped short at the library listening to sounds of laughter and animated conversation. He smiled to himself, his eyes gazing at a distant memory as he turned back and returned to his room. Book by dusty book, the library came together again. The books were arranged simply and neatly, the floors clean, the walls white-washed and the room lit up with new bulbs. Finally they stood back, and admired their first endeavor together. On the 11th day, as they were ready to make the long journey back to Bombay, Prasad Anna gave them a bundle of books. “Your wedding gift… sometimes , the real gifts take a bit of waiting for. The gates came into view rather abruptly as they rounded a bend in the road. The new caretaker came to greet them as he parked his car. Prasad Anna had passed away 3 years ago and his caretaker now had the run of the place. Their bags were taken to their rooms. And he went to take a shower. She was gone when he returned to the room. And he had a feeling that he knew where she was. He found her sitting in the library, her hands in her laps, her eyes glistening with tears. The library was in disrepair, termites covered many books, cobwebs darkened the corners and the glass windows were so covered with soot that they barely let in any light. Ignored, uncared for, unloved, the library was dying… much like their own marriage. The books were the same, a bit tattered maybe but they can always be fixed… the room was dirty, but that could always be cleaned up, and then there were the two of us. Could we somehow ‘fix’ us also? Burnish our memories so that they shone again with memories of happier times ? Wash away the tiredness and frustrations of bringing up a brood of kids, managing a career and preserving your own sense of self? Or maybe, just paste a new label on a shining cover and turn the page to embark on a fresh adventure together. He looked at her again. She was staring straight at him, the tears in her eyes made him wonder how they had fettered it all away. The money was important, so was taking care of family.. the business trips that kept him away for months.. they were important too.